Along with Sterman, Dr. Evan Alley and Dr. Steven Albelda helped create and implement the TR002 clinical trial. Alley is currently at the Cleveland Clinic Florida but worked at the University of Pennsylvania during the early stages of the trial. Albelda is a professor at the University of Pennsylvania’s Perelman School of Medicine. Some of the doctors involved in the trial are included in Mesothelioma Guide’s doctor match program, which helps mesothelioma patients find an expert for treatment, surgery and more. Trizell Ltd. announces Phase 3 pivotal study of interferon alfa-2b gene therapy in malignant pleural mesothelioma. PR Newswire. 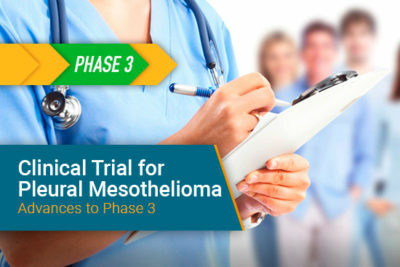 Retrieved from: https://www.prnewswire.com/news-releases/trizell-ltd-announces-phase-3-pivotal-study-of-interferon-alfa-2b-gene-therapy-in-malignant-pleural-mesothelioma-300815572.html. Accessed: 03/22/19.